Camera Phones – The End of Traditional Photography ? It used to be obvious when a sneaky photographer was looking to take some covert shots. The camera was there for all to see. Now, however, with the growth in smart phones offering the capability to take pictures, the wannabe photographer specializing in candid photography has been given an advantage. Even at events that were once ruled by professionals (e.g. weddings), it’s possible to see lots of pictures being taken with mobile phones. You might think it easier to leave your camera at home and just take photographs with a smart phone. However, how good will the return on investment be for your apparent ‘smart thinking’ ? Time to reveal if that smartphone can cater for all of your photography needs. Is this the end for professional photographers ? Are digital phones taking away the professional’s custom ? For the up and coming photographers, what direction should you take ? Is it even worth learning about photography skills any more, with smart phones seemingly doing everything ‘automatically’ ? What about customers ? Is it possible to get the same standard of photographs with mobile devices, rather than spending higher sums of money on a professional camera or a photographer ? Interesting questions, which are worthy of consideration. Any professional, who has been around for a while, will always feel threatened when new technology appears on the market, and that is understandable. Television threatened the radio stations. CDs threatened the cassette manufacturers. Computers threatened…… everything. When one industry is threatened or killed off, the ‘old guard’ usually adjusts accordingly. Should photographers be concerned about smart phones then ? Whilst I have said above that camera phone technology is improving, it is still way short of providing the same quality outputs that a camera can…… a long way short – But why ? Shortly after digital camera technology started pushing traditional film aside, the manufacturers tried to convince us that the more megapixels you had the better. Costs of cameras with higher megapixels were considerably higher than the lower megapixel counterparts. Whilst it is true that you do need a minimum number of megapixels to see the finer details of the image, the overall quality of the picture really depends on the number of megapixels in a sensor and the size of that sensor. What the manufacturers found was that adding more megapixels onto a sensor, without making it larger, produced images with ‘digital noise’ (a speckled, grainy effect). Things have improved, with manufacturers now attempting to optimize sensor sizes with megapixel count. This is to keep cameras themselves at a reasonable size, whilst still producing top quality images. So is that an issue for the cameras on mobile phones ? Smart phones have ‘shrunk’ over the years and their slim casings are clearly stuffed with the very latest in communications technology. Although the camera part of the ‘phone’ is an important selling point, the technology here comes second to the phone’s need to make calls (obviously). This results in phone cameras having small sensors, poor quality lenses and not much in the way of gadgetry to improve the quality of the pictures. On the other side of the coin, traditional digital cameras are all about quality photos and providing you with sharp, clear pictures every single time. So whilst they might be somewhat larger than mobile phones, you do get a lot more camera technology for giving up a little space in your pocket. Technology included which automatically reduces blur and stabilizes the images to keep them sharp. Smile shot and blink detection, on the latest models, to keep your subjects looking their best (no more having to take a series of shots to get everyone with their eyes open). A powerful flash – plus red-eye reduction technology to improve portraits taken in low light. Memory cards so you can keep shooting. An engineered quality glass lens with an optical zoom. Great quality images that can be printed and enlarged with no concerns about blurring. Digital zoom lenses producing lower quality images. Image quality is limited, resulting in some images being too poor to have printed. So what exactly is the problem with mobile phone photography then ? When you take pictures on a phone, you have to hold it in front of your face to see what you are capturing. You are therefore restricted in how you take your shots. Some compact cameras, on the other hand, now have flip out LCD screens that allow you to shoot from awkward angles, such as above your head or down by your feet. This allows you to shoot without taking your eyes off the screen. This can come in handy when photographing concerts and other busy, or space restrictive, events. 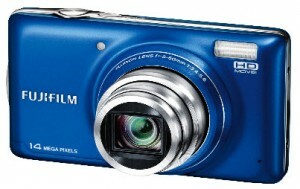 The Samsung MV800, which is reviewed in this article Advanced Digital Camera Reviews is a classic example of this. The issue of image quality shows itself with extreme close-ups. Camera phones usually have digital zooms rather than higher quality optical zooms found on compact cameras. Digital zooms have to crop an image to ‘zoom’ and also reduce the resulting quality of the picture. An optical lens, in a digital camera, is physically moved (zoomed in and out) which preserves the details when magnifying a scene. What about printing my pictures ? Being able to make real prints which high-light the details of a scene; show the brilliance of the colors and are not awash with ‘digital noise’ depends on quite a few factors. If you want to create a large canvas pint of your pictures, then a dedicated camera with a large sensor and lots of megapixels will capture the image much better than the same image caught on a camera phone with a tiny sensor. Don’t get me wrong, you can still print images captured with mobile phones and create products with them. However, a camera with a larger sensor will be able to capture more detail – and more detail in an image means a better looking final product. A minimum of 10 megapixels in a camera’s sensor should provide all the detail your pictures need. Photos captured on the highest quality setting can be enlarged to high measurement canvasses without any loss of detail – assuming the image is in focus to start with. Cameras haven’t just appeared overnight – they have ‘developed’ over many years. Compare that with mobiles which are still in their infancy (and phones with on-board cameras are even younger). Modern photographic equipment is very well made with each component being precisely crafted. Lighting issues and proper framing of the subject are all taken care of automatically, or can even be manipulated where needed. Will professionals ever accept the lower quality of a camera phone ? Very unlikely. Okay, you can make manual adjustments of images using computer software, but that takes time and skill. Far better to take a quality shot in the first place. Fashion photography, forensic photography, or any photography work that will end in publication is not likely to be shot using a mobile phone. You see people holding up mobile phones to take a ‘sneaky shot’ at a concert. Then you see the result on flicker or Facebook – just a mass of blurred lights in the distance. Was it worth it ? Then there are the shots of everyone out in a dark bar…. Lots of blurred, grainy images – “You look really good in that outfit….. I think” !! Camera phones do have their place and they can be great fun for taking a quick ‘unplanned snap’. However, if you are going to a planned event whereby the images will be ones that you will want to look back at again and again, then you should seriously consider investing in a proper camera. Just leave the phone for texts and making calls. With a specialized compact camera in your bag or pocket, you will be able to capture images that can be printed, enlarged, and shared with friends and family without any quality concerns. 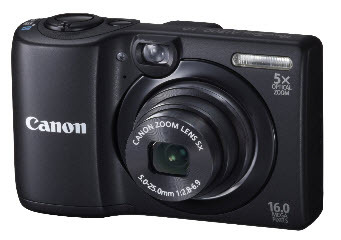 If you are searching for a camera with the sleekness of a mobile, but the functionality of a great camera, then I highly recommend the Canon PowerShot ELPH 110 HS. This camera has a slim, body that’s packed with helpful features such as a 24mm Wide-Angle lens with Optical Image Stabilizer. Ideal for ensuring lots of detail into your photos. At just 0.8 inches thick, it’s not going to bulk out your pocket, but you will notice the difference in your picture quality. 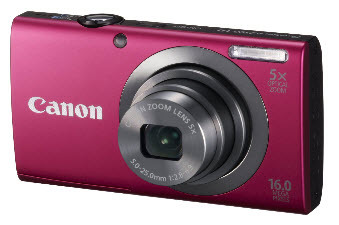 To read more about the Canon PowerShot ELPH 110 HS, to see the alternative colors available or to purchase, please click on the link below. I hope you enjoyed my thoughts on whether camera phones are the end of traditional photography. Feel free to comment and please share, using the social medial links below. Welcome to my wedding photography tips. For the professional, I do have a separate article as part of my Photography Business series of articles called ‘Make Money From Wedding Photography’. The article you’re reading, however, is for the person who is just looking to take some great photographs on ‘the big wedding day’, perhaps as a gift for the happy couple. You can capture beautiful memories of the wedding day, whether you’re making movies or shooting stills. Photos and videos are always important to people, but those captured at weddings understandably become the most cherished of all. The happy couple, with all their friends and family, all dressed up looking fantastic, celebrating a new marriage, in a beautiful setting. Fantastic pictures are virtually guaranteed. Although the majority of weddings have professionals to take care of the photographs, if you are a guest there is no reason why you can’t also take images or video to be proud of. Prior to the event, ask the bride and groom if they are happy for you to take pictures and / or video during the service. If they already have a professional photographer or videographer, you shouldn’t obstruct that person from doing their job. There is nothing worse than having an angry-looking bride or groom watching you buzz about like an uninvited, annoying, mosquito. Taking your own pictures and making them into a gift for the couple is a thoughtful way for them to remember their big day. Do check your camera or camcorder’s batteries are fully charged and remember to pack spare charged batteries if you have them. You could even bring your chargers for emergency re-powering during any breaks. Be sure to carry spare memory cards as well. They don’t take up much room in your bag, but can be a real saviour if you get ‘snap happy’. Key to great wedding photography techniques is your initial positioning. Get this wrong and no matter how good a camera you’ve got, it’s not going to make up for any awful ‘lines of sight’. If you can get into the wedding venue prior to the ceremony starting, have a look around for interesting backgrounds or vantage points. This is where you’ll be guaranteed a good view of the event. Can you see the couple ? Will your camera block someone else’s view ? Assuming you won’t clatter about, see if you can place yourself at the end of an aisle and move around during the ceremony. This will enable you to get different perspectives on the action. Remember, the couple will no doubt have spent considerable time making sure that all the details of their big day is perfect. So ensure that you get pictures of the small things for them to enjoy after the excitement (and stress) of the day is over. For the happy couple, everything will just wash over them and, with so many things going on, they are likely to miss many of the finer details. Images of the invitations, the service schedule, any flowers or decorations, the place settings etc. All of these will be treasured by the bride and groom. They also make nice background images for adding color to photobooks. For many couples, the best part of a wedding is reconnecting with the people they love; seeing them all in one place; and of course looking their best. There should be many candid smiling faces which you will want to record. 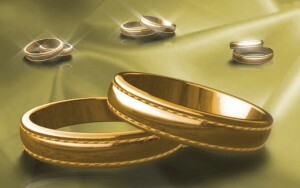 Prior to the big day, think about the important people at the wedding besides the newly weds. Key support personnel (bride’s maids, best man, person giving the bride away). The bride and groom’s parents. Any children who are close to the couple. And make sure you get pictures of other guests as well – give the newly-weds reminders of ‘the quiet ones who were there, but melted into the background’. 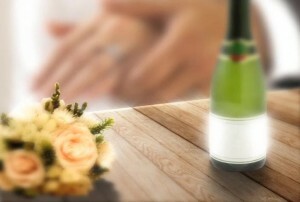 If you are really looking to impress, why not try some trick photography on the day ? It’s actually easier than you think. 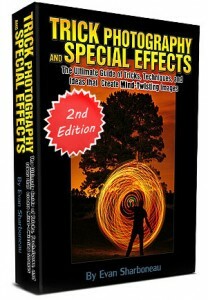 By far the best course on trick photography is Evan Sharboneau’s Photography Tricks Course. You can actually get started immediately (you view the videos on-line and you can download the 295 page course straight to your computer). You might even be able to put the hired professional photographer to shame. 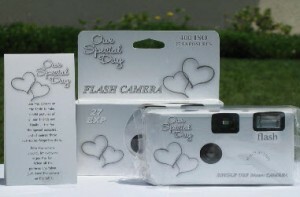 One good idea to get plenty of shots of the wedding is to provide each guest table with 2 or 3 disposable cameras. Invite the guests to snap what they want throughout the day and night (you could even start this off, by having some laid out in the church). Have a ‘bucket’ for the cameras to go into once they have been finished with. If you are looking for a wedding camera that can cover all of the tips I have mentioned above, then I would highly recommend the Canon Powershot SX260. For those unrepeatable moments you need a camera you can rely on and this one really won’t let you down. This camera is actually designed to take fantastic images in poor light conditions without the need to use a flash (ideal for inside a church, or when speeches are being made and you don’t want to blind the speaker). Really this camera is ideal for any formal occasion. It’s also pocket-sized and looks great to. It comes in 3 eye-catching colours : black, green, red. Bride coming into the venue. Key individuals (couple’s parents) during the ceremony. Bride and groom leaving together. The bride & groom’s reactions. Remember, when zooming in and out, it’s very difficult to keep your hand steady. Before you press the ‘record’ button you should frame the shot first. The result will be a much more professional appearance. Action of what is going on in the background is important as well as focusing on the couple themselves. This all helps to tell the story of the day if you are looking to make a short movie for the couple. Capture the venues, modes of transport, meals being served etc. Filming with a camera is all very well, but for a really professional looking DVD of the event, you will want to invest in a camcorder. 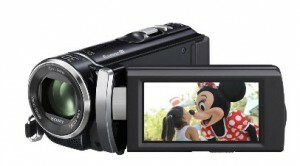 The Sony PJ200 is an ideal wedding camcorder. Not only does it capture video in full HD quality, your footage can be instantly shared and reviewed with the on-board projector. This turns any white surface into a screen. Steadyshot Active will keep your footage steady, while the huge 25x optical zoom ensures that you won’t miss any moments. I hope you enjoyed these wedding tips and take a look at the equipment I’ve recommended. Please feel free to share these wedding photography tips with your friends, using the social media links below. Welcome to my summer photography tips. In this article, I’m going to look at taking portraits outdoors in the sun. It can be really fun photographing families, especially in the summer when spirits are high. Children especially are fun to work with when you catch them in the right mood. The moments you capture can end up being treasured keep-sakes for years to come. Sometimes though, children are not in the mood to be photographed and, no matter what you do, you just end up with images of them with a big sad bottom lip sticking out. If you can get over that (with bribes), here are a few tips to make the most of your shots. Generally, the days are longer at the peak of the summer, giving you more time to take pictures. Take advantage of this. Focusing your photography to early in the morning or later in the evening gives you the benefit of the sun being lower in the sky. 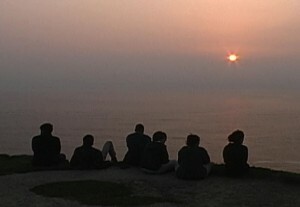 To get warm images, which are filled with light, manoeuvre your subject in front of the rising or setting sun. Silhouettes can also make for dramatic shots. If the sun is too bright, you might want to consider an alternative setting. People can often look very unflattering squinting into direct sunlight. Even if they are facing away from the sun, harsh shadows can form across their faces if they are surrounded by bright backgrounds (e.g. white sand or a white-washed painted Mediterranean villas). To counter this, try moving your subjects into some soft open shade. A tall building or trees often work well. Just remember to keep them facing towards the light from the sky. This usually produces a sufficient amount of light which is ideal for photographers. It is crucial in portrait photography, whether inside or outside, is to ensure that the background of the shot is tidy. Nothing confuses the brain more than to see a great portrait what has lots of ‘noise’ going on in the background. If it really is impossible, or too much work clearing the background, then just cut that out by zooming into your subject. You can do this in two ways. Either with the camera’s zoom, or by moving yourself closer to the subject. It’s a very simple tip but very effective. Another tip is to simply place your subject against a plain background. Try using a painted fence or garage door. Remember this is portrait photography – you are focusing on the upper part of their body and head. Don’t just take a full length shot of them against a plain background – that will just look boring. Alternatively, a doorway is a good way to frame the picture. Despite what I’ve said above, don’t entirely rule out background shots. They make for great ‘scene setters’ and act as reminders to your family of special places in their lives. The same rules apply however – keep them clutter-free. For example, if you are taking a photo of a view, don’t have a load of trash cans placed in the foreground. It sounds obvious, but you’d be surprised how many people finally get round to looking at their photos only to be disappointed with the additional junk that they didn’t think they’d captured. If you are close to your subject, get to their eye level and keep the focus on their eyes. As you get more experienced, you might want to experiment with the composition by placing the subject off-center. You can get really great photos with point and shoot cameras. However, as simple as these cameras are, it’s still a good idea to familiarize yourself with the settings. The ‘portrait setting’ (which is shown by a silhouette of a head and shoulders) is the one you’ll want for taking pictures of friends or family where they are the main focus of the composition. The result of the shot will be to create a slightly blurry background so your attention focuses on the main subject. The ‘sports setting’ (often indicated by running silhouettes) will set your camera up with a faster shutter speed. This will freeze the action and is ideal for capturing fast-moving subjects, such as children running about in your garden. How many times have you heard a photographer say to his subjects “Say CHEESE”? It’s the worst thing you can do. It just creates a load of false smiles and grins. Just be patient and wait for the right moment. In the summer, you should expect to see happy smiling faces, as people tend to be more relaxed and in a good mood (as long as it’s not too hot). As a photographer, you should be equally as chilled out. Try telling a joke or making them laugh. Get ‘into the spirit’ of the occasion. You want to capture people’s natural character remember. Don’t line them all up like soldiers and expect ‘natural’. Get them to talk about things they like or the surrounding area. I hope you’ve enjoyed my article on summer photography tips. Please share, using the social media links below. 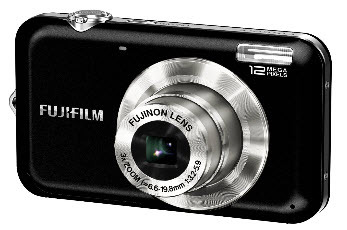 Thank you for visiting my Point and Shoot Camera Reviews page. If you want an overview of all the many types of digital cameras, then you may want to start at my What Type of Camera Should I Buy article. Point and shoot compact cameras are at the ‘value for money’ end of the market. However, they still provide a high level of specification, but for a great budget-friendly price. They are very easy to use, with many automated features, and can easily fit into a pocket or bag. If you are looking for a camera to capture great images, but don’t want the stress of thinking about what setting to use, then these are the cameras that have been made for you. Whether this is your first camera purchase; you are looking for something simple that you can carry around with you for taking great candid shots; or you are just looking for the best point and shoot camera on the market, then this is the page you have been looking for. Todays best compact cameras all have impressive features, but what should you be looking out for ? In point and shoot cameras, the zoom ranges are generally more modest than in Super Zoom Cameras. However, you can still capture a fantastic range of pictures. Most models will come in a selection of different colours. In addition to traditional black or silver, why not try pink or metallic blue ? I have decided to review two Canon digital cameras. The first is the A1300, you can really snap up some fantastic images thanks in part to the Smart Auto Mode. This picks the best settings for up to 32 different scenes (i.e. the camera assesses what you are taking a picture of, and in what conditions, and sets the camera up for the best possible result). Portrait – brings focus to the subject, whilst blurring the background. Face Self-timer – won’t take a shot until a face enters the frame. Super vivid – Brings the colors to life. Fireworks – Enables you to take spectacular shots of fireworks. Long Shutter – Blurring effects when taking moving objects (think of the light trails left by cars or stars at night). Discreet Mode – Turns off all lights, flashes and camera noises at the flick of a switch. Enables you to take pictures without disturbing others (e.g. babies asleep). Fish-eye effect – Classic distortion without actually having to have a fish-eye lens. There are many more scenes to play with (see A2300 below). 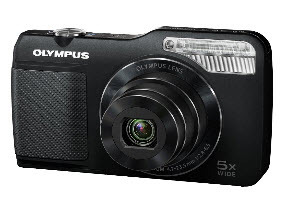 Even though it’s quite a slim camera, it still has a powerful 5x optical zoom lens. Unusually, this camera has an optical viewfinder as well as the standard LCD screen at the back. The optical viewer comes into its own in bright sunlight when it can be impossible to actually see the image on the LCD screen. It’s also useful when your batteries are running low and you want to save energy by switching off the LCD screen. The zoom range is from 28mm (for wide-angle sweeping landscapes, tall buildings or large groups of people in a line) and goes to 140mm (telephoto to really zoom in on your subject). There is an excellent Help Button signified with a “?” button on the control panel. This gives you a help and advice on the LCD screen. There are plenty of answers to common questions and it even gives shooting advice. It also hi-lights, on a diagram, the buttons you are going to need for any given function. 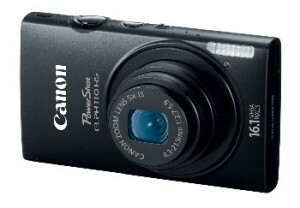 The Canon Powershot A1300 camera works great and you won’t need a 25 page manual to work out how to use it. Please click on the link below to find out more, see other colors, or to purchase the A1300. 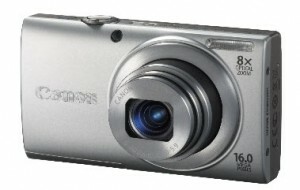 The Powershot A2300Small and simple to use, but still packed with a variety of features. It includes the Smart Auto Mode which makes photography easy even for beginners. Of course there are going to be many similarities with the A1300 above. Here are some of the special scene modes that did not get mentioned in my A1300 model review above. Smart Auto – The camera will select the best settings based on the surrounding environment and lighting conditions. Program – The correct aperture and shutter speed combination is selected dependent on the shooting conditions. Monochrome – You have a choice of Black and white, blue, or sepia (those old brown photographs). Toy Camera Effect – This gives the impression that it’s been taken by an old pin-hole camera (darkening the edges of the photos). Digital IS – Any Image blur is corrected automatically. Snow – Snow scenes can be difficult to shoot, often leaving the subject darkened or with a bluish tint. This setting corrects that. Live View Control – Adjustments to color, tone and brightness done with controls which are easy to understand. 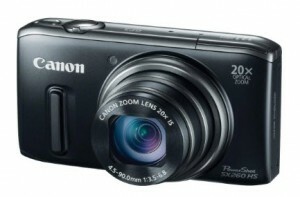 Overall, the Canon Powershot A2300 is a smart little camera which is ideal for the casual user. It does everything you would expect a camera of this price range to do. Slim, enabling this model to easily slip into your pocket or bag. Performs well at taking action shots thanks to the digital IS. A lot of camera for a little price. As with the A3100, there is a small shutter lag (i.e. it takes the photo a second or so after you press the button). Be careful when handling this model, it can be a bit slippery. Please click on the link below to find out more, see other colors, or to purchase the A2300. Like Canon, I have included two Fujifilm digital cameras. 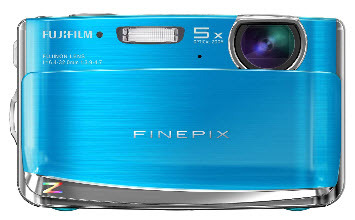 The Finepix Z70 really has got some style about it coming in some fantastic colors. The controls are lit up with LED keys. These enable functions to be navigated easily, even in dark conditions. It really has got some good face retouching functions and you even have editing features for the movies that you take. There’s also a good range of editing features for the still images. The Finepix Z70 has a great feature called Target Focus. This helps keep the subject in the frame and in focus if it is moving and you are panning with it. It’s actually quite pleasing to see such advanced features in an entry-level camera. The zoom doesn’t poke out from the camera body, to this might suit some photographers who are inclined to knock, or drop, the camera. When set against other camera’s in this class, the Finepix does a great job in bright light. Like many photographers, I would tend to use this camera using the auto mode. However, the Z70 does allow you to manually program the exposure – a touch of professionalism for those that want to go down that road. The automatic scene recognition is very capable at doing the ‘thinking’ for you. Whilst it’s not the best camera in this list, overall it’s not a bad choice with some fantastic features. Please click on the link below to find out more, see other colors, or to purchase the Z70. This is great for first time photographers. Face detection is included and is, in fact, becoming pretty common-place. However, this camera also includes smile and blink detection and automatic red-eye removal. Smile detection will automatically take a shot as soon as the camera senses a smile, and the blink detection will warn the photographer that blinking has been detected. Scene detection is another included feature and this allows the camera to select optimum settings depending on what is in focus (i.e. subject being near or far; and in bright light or low levels of light). It also has a great Tracking Auto Focus feature. This will ensure you get a sharp image when ‘tracking’ a moving object. Start up and shut down times are quite good for this type of camera. Although focussing is not the quietest I’ve come across, it does it quickly enough to get a tick in my book. Whilst there is no image stabilization on the lens or sensor, the ISO will adjust the shutter speed appropriately. The level of fine detail this camera produces is very impressive for a point and shoot camera. Please click on the links below to find out more, or to purchase the JV100. 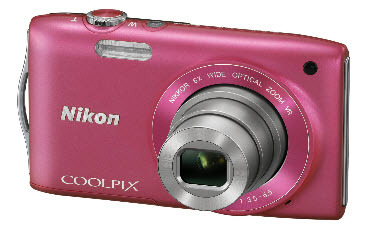 The Coolpix S3300 Nikon digital camera is slim, easily slips in your pocket or bag, and is very colourful. Equipped with a 6x zoom lens, it will get you close to the action. Meanwhile the very impressive 720p HD video takes great movies that look great when played back on a HD TV. Image stabilization reduces the effects of camera shake, even when you fully zoom in. Linked to this, the ‘sports setting’ allows you to take moving objects with ease, leading to great results. As with many cameras within this review, the S3300 comes with a selection of scene modes. This allows for the camera to pick the best settings for that particular ‘scene’. Included in this feature include : Beach, Landscape, Sunset, Snow and the previously mentioned Sports settings. Digital filters are always a welcome addition, and this camera includes High-contrast mono-chrome, Nostalgic Sepia, Soft, plus a few others. The buttons on the Coolpix 3300 are kept to a minimum, making operation of this camera very easy. The camera is excellent at capturing multi-coloured images, without the colours bleaching into each other. ‘Noise’ levels are also very good, resulting in a very crisp shot. On video recordings, the optical zoom has to be set prior to the starting the recording. You can still zoom in after this, but it has to be with the digital zoom – which generally produces inferior results. This isn’t a major issue however, as many cameras at this level don’t even allow you to make any adjustments after you start recording. The self-timer only allows for countdowns of 2 seconds and 10 seconds. Whilst this might be a bit restrictive for the real enthusiast, it shouldn’t be an issue for the average user of this camera. Please click on the link below to find out more, see other colors, or to purchase the S3300. Simple controls on top of this Olympus are a dream for the inexperienced user. A separate button for movies is clearly identifiable and good if you are looking to take a quick video. The Olympus VG-170 has a flash that is double the strength of other compact cameras – hitting subjects up to 15 meters away. The lens starts at 26mm for a nice wide-angle, stretching to 130mm to really bring those subjects close. Shake free shots are virtually guaranteed with Digital Image Stabilization. The ‘Beauty Setting’ feature is designed to alter portraits. Skin smoothing and brightening can make even the most senior member of your family look like a teenager. Face lengthening and even changing the color of someone’s eyes is all possible from the control panel of the camera. Where the VG-170 differs from other models in the point and shoot range is the fact that it has a nice textured case. This enables a better grip on the camera. Some might say that the plastic body feels cheap but, to me, it keeps the weight down. The menus on this camera are a bit deep in places, but well designed and follow a logical pattern. Short cuts are available for those wanting to ‘get there now’. Battery charging actually takes place whilst it is still inside the camera. You can actually plug your camera into your computer (via the USB port) to do the charging. You need to be aware though, it can take up to 10 hours to re-charge the battery using a computer. A much more acceptable 4 hours re-charge is obtained from a standard electrical outlet. A surprising feature for an entry-level camera is the 3D shooting option – although you will need the old-fashioned red and blue lens glasses to see the effect. It’s also up to you to actually take two shots of the same image – although this is partially done automatically. Whilst this is clever feature which looks good on-screen, the images don’t translate particularly well when printed out. Overall, this camera does offer something a bit different from other models in this review. If you want to experiment a bit with on-board editing and 3D modes then you might want to pick up this model. 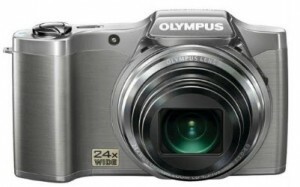 Please click on the link below to find out more, or to purchase the Olympus VG-170. 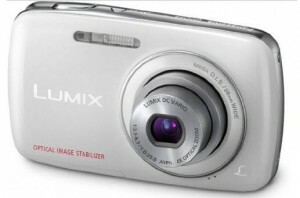 The Lumix S3 Panasonic digital camera provides the user with great all round specifications. Optical Image Stabilizer – Corrects any image blur as a result of hand shake during the picture-taking process. Intelligent ISO Motion Detection – Compensates for any subject movement whilst you are taking the photo. Face Detection – This optimizes the shot to prevent blurring of facial shots (caused by the camera focusing on whatever is at the centre of the shot). Intelligent Scene Detection – Automatically sets your camera up for the best shot in any given situation, such as : Scenery Mode, Portrait Mode, Macro Mode, Night Portrait Mode, Night Scenery Mode, and Sunset. The Lumix Image Uploader makes uploading to social networking sites like YouTube and Facebook pain-free. The rounded edges and lightweight plastic casing of the Lumix S3 has raised questions about this camera looking more like a child’s toy, rather than a genuine piece of photographic equipment. However, I feel those assertions are somewhat harsh and unfair. This camera also has its fans because it doesn’t look like an updated boring square box from the 1970’s. I would say that, the Lumix S3 is aimed at first time photographers (teenagers in particular will love it, with its funky colours). It is simple to use and pretty idiot proof. The images captured with this unit are not always going to be perfect. However, the camera’s good points far out-weigh its limitations. You cannot zoom in whilst videoing. However, that is not entirely unusual for point and shoot cameras (even though a few of the other models I’ve reviewed here do offer that facility to varying degrees). This camera does, in fact, have a lot to offer, under its plastic exterior. Please click on the links below to find out more, or to purchase the Lumix S3. That concludes my review of the Point and Shoot cameras. I’m very confident that you will find something which suits your needs in this list. I hope you found these reviews helpful. What Type of Camera Should I Buy ? Please feel free to share these Point and Shoot Camera Reviews, using the social media links below.